Treasure Trooper impressed me a lot! Not because of the income potential but because of the creativity of the developers. They managed to create a fun and engaging system that makes people stick to the platform and complete offers and surveys in exchange for different currencies. I think it's pretty addictive! There is so much to talk about Treasure Trooper that I had to pick up only the most important features otherwise this article would become a book. If you're looking for a reliable strategy to earn a full-time income online, check out my #1 recommendation. 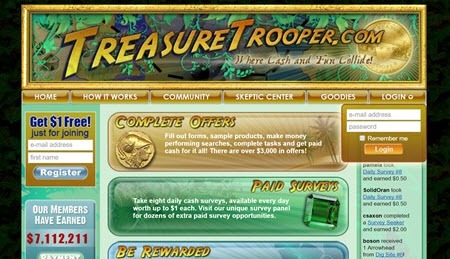 Treasure Trooper is a peculiar GPT (get-paid-to) site where you can complete surveys, offer and other simple tasks in exchange for cash and gift cards. The site has been running since 2005 and has paid over $7 million. 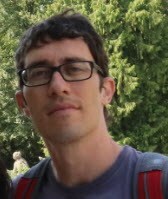 So, it's highly reputable and you can check out payment proofs that are constantly sent by members. The sign up is free and very straightforward. 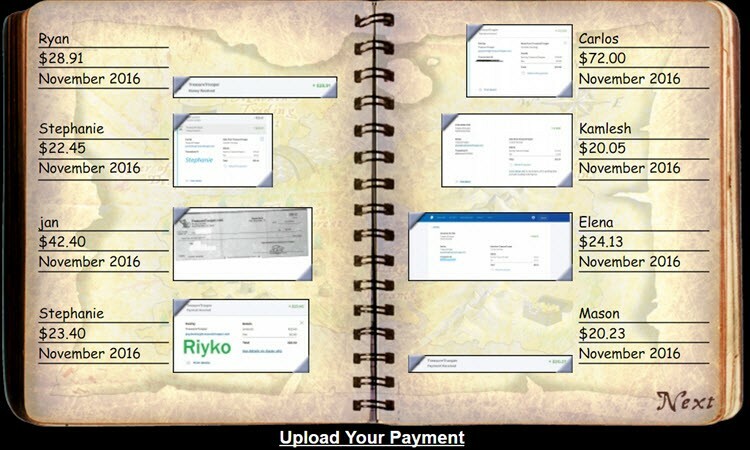 You just have to provide your name, email, address and the payment method of your choice. This can can be either via check or PayPal. I know You are Lost! It's hard to know where to start when you first login. There are so many different options! So, the first thing you should know is that there are different 'currencies'. Each currency can buy you different things and can be exchanged with one another. Different 'currencies' are earned according to different tasks you complete. Also, the same task can earn you 2 or more different currencies. For example, offers that pay in cash will also earn you gold coins in one go. You can also complete offers to earn Platinum Coins in the "Platinum Rewards" section, and Arrowheads in the "Arrowhead Dig Site" section. Take Online Surveys: Companies will pay you for your opinions and personal information in order to perform marketing research. Trial Offers: Get paid to try out products, Apps, services, websites and to participate in prize competitions. Watch videos: Earn cash or dragon scales for watching advertising videos. Listen to the radio: Listen to Radio Loyalty and earn 1 Arrowhead each and every 10 minutes. Shop: Earn cash back buying products through the platform. Search the web: Perform your daily searches (powered by Google) using their search engine and earn Arrowheads from time to time. For a better alternative, read my Qmee review. Be extra cautious when completing offers, especially the ones that require your credit card details. Read carefully the terms and conditions, and unless you want the product/service, don't forget do cancel your subscription before the trial period. Next, I am going to show you how to earn different currencies and what they are used for. Heck! So Many Different Currencies! How to earn? Click on "earn" in the menu and choose any option where you see the word cash in front of it. Use: You can withdraw cash using PayPal or check. You can also use cash to buy platinum coins and scales in Mabutu's currency converter. How to earn? You earn gold every time you complete offers that pay in cash. The higher your cash reward, the more gold you will get. Use: Exchange for Treasure Map Pieces, Journal Pages, Mabuto's secret, among other things. Each map piece costs 10 gold and you need 4 pieces to participate in the Treasure Hunt worth $100. How to earn? Some cash offers will earn you platinum coins as well. However, you can find most of them by completing offers, surveys etc, in the "Platinum Rewards" section. Use: You can exchange platinum coins for various gift cards (Amazon, eBay, Restaurant) and electronics. You can also buy Pearl (another virtual currency). How to earn? You will find arrowheads in the Arrowhead Digsite section. There is nothing new here. All you have to do is complete surveys, offer and other different tasks. You can also get arrowheads using the cash search. Use: Arrowheads can be exchanged for dragon scales and platinum coins. Use: Scales are basically used to hatch the dragon, buy all the essentials for their growth, and combat upgrades. You will do that inside the Coog's Coop. I know you want to make money and not play a bloody video game. So what's the point of all that? Well, you can later on sell your dragon for cash. And they claim that some rare dragons are worth $100! WOW! You will spend time working for marketing research companies without having a clue of how much they will pay for your dragon. This is certainly a very intelligent strategy for them, but not for you. How to earn? There is no place explaining how you can get Pearls. I suppose the only way is to buy them using platinum coins. 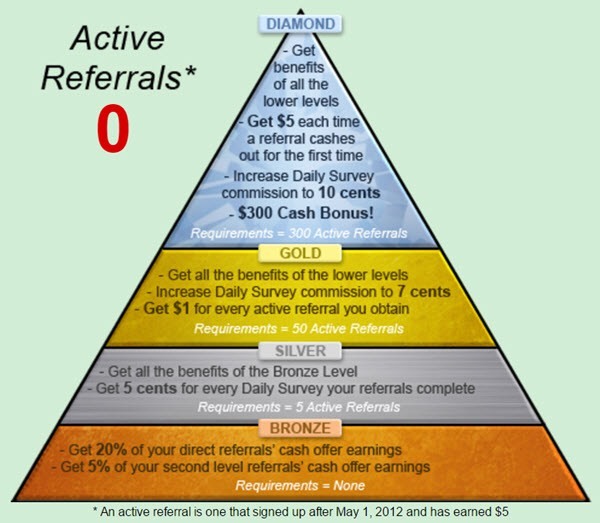 Use: I can only see two uses for Pearls: Turning unreferred members into your referrals and buying the Vault Key. You need 5 Vault Keys to open the treasure vault. Once inside, you 'll be able to complete 3 special offers for $0.50 each. I'm confident this is the best way to make money with this platform. 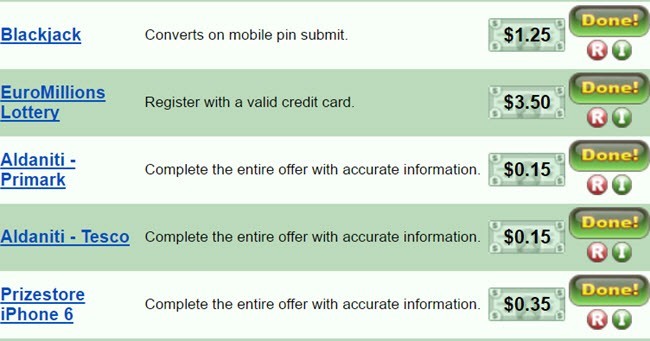 Once you refer other people to Treasure Trooper, you will get 20% in commissions every time they complete an offer. How can you refer other people? You need to promote your affiliate link. When someone clicks on your link and signs up, they will be automatically assigned as your referral. Check my #1 recommendation to do this the right way. They will send your payments by the 20th of each month as long as you meet the minimum balance of $20. If you live in the United States you have an advantage. You can request instant payments as soon as you exceed the minimum threshold. Treasure trooper is a legitimate and very interesting GPT site. The important question now is: Is it worth it? I think it's over-complicated and you can easily lose track of how much they pay you for your time. As I said, I am not a fan of earning pocket money with trial offer and online surveys. I prefer to use time more effectively building my own online business. I'm confident this is the best strategy your can possibly follow to eventually work full-time from home. If that's what you really want, I can't recommend Wealthy Affiliate highly enough. 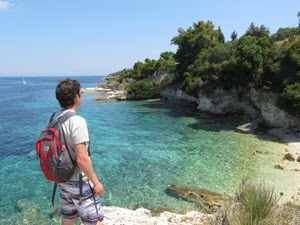 I can assure you this is the most cost-effective platform to get proper education and build your own online business. You can even give it a try completely free and judge it for yourself. No strings attached! So, have you tried Treasure Trooper? What is your opinion about it? Feel free to give your opinions and share this article with your friends if you like it. I like the website and the contents. I’m never tired of knowing good ways NOT to waste my time. In this case it seems like just a poor alternative. Thank you for the thorough information and review. I couldn’t find a search button but wonder if you’ve ever heard of/reviewed Swagbucks, Acorn Hunt and Slidejoy. I’ve mostly used the latter but wanted to know if you have any thoughts on these Apps. Thanks for your feedback. You’re right in looking for better alternatives for your time. The internet is full of shiny objects that just keeps you going round in circles. I have reviewed Swagbucks but not the other ones. I will bookmark these 2 sites so I review them in the future. Thanks for the tip. :)GPT sites can help supplement your income, but the time VS reward is just really bad. Those who are not afraid to learn and put in the effort are much better off building an online business. It’s much more profitable in the long term and anyone can get started with simple step by step training. This site is awesome. IT is better than the average and very interesting. I like it because it shows a different side of surveys and make it interesting to want to sign up. I have been looking for different survey sites to make a little extra money, but they seem to be a waste of time. I will be looking into his one for sure. I Love Treasure Trooper! Got my christmas presents paid for with paypal cashout and amazon gift cards, just had to spend time doing surveys and offers a few mornings or nights a week! It really is addictive because everything has a team bonus on it now. Hourly and daily contests in the chat room, weekly and monthly on the forum! Everyone needs to view these sites as supplemental in your bankroll and earnings arsenal IMHO, not somewhere you sit for 12 hours a job. Suddenly you view the site as something to do to kill time or do while watching tv and it is friggin awesome lol. What were you doing before I ask? Eating? Scrolling social media? It monetized my zombie time.